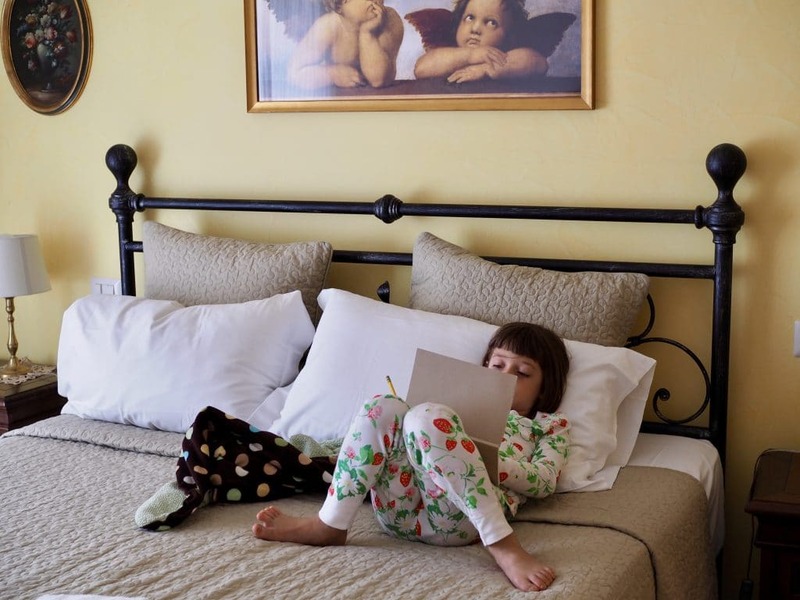 Can you believe I am writing about our Italy trip now and not 8-10 months from now? I promised myself I would write and share photos along the way because a month long trip would have way too many details to remember if I don’t write them down. 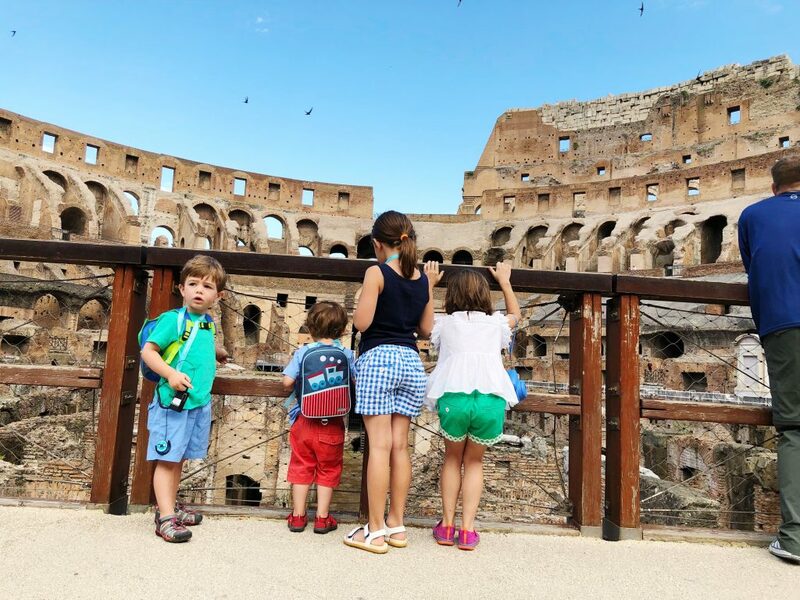 I’ll share some memories and photos along the way with some info on where we stayed, what we ate, etc in case you want to use this for planning a trip to Rome with Kids. So here goes…. We took an overnight flight to Rome. I was pretty nervous about how that would go. I started my day off with yoga in hopes I could add a little more zen and a little less “want to parachute off the plane”. We gave the kids baths and put them in pjs before the airport. I also had Tommy skip his nap that day. He fell asleep before the plane took off and we woke him at landing. I’ll share some flight “gear” I bought before the trip and what was great and what to skip in another post. Miles slept most of the flight too but he likes to roll around and sleep on his belly, so that wasn’t really doable on the plane! The girls were dying to try “an airplane dinner” so they begged to stay awake for that…. ate none of it…. and then passed out for the rest of the flight. 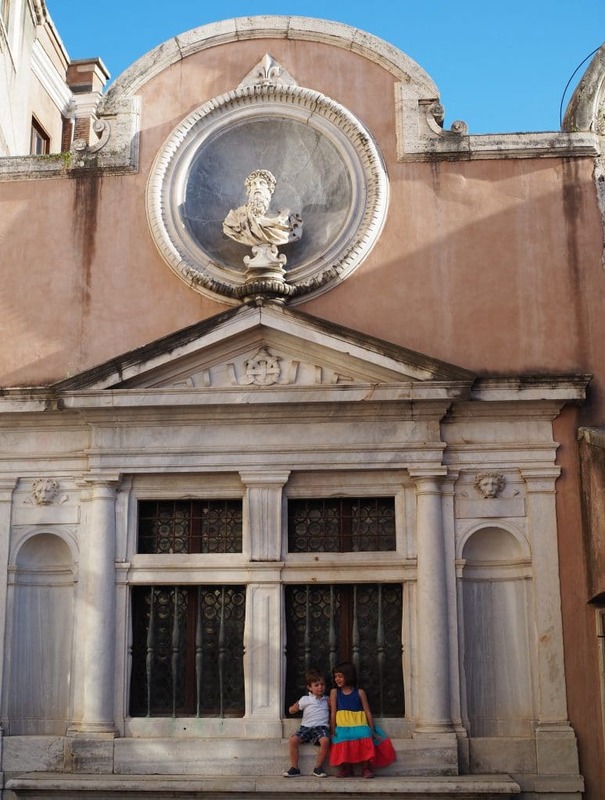 We took a car to our apartment and got settled in to Rome! I tried to keep everyone awake and stick to normal bedtimes to adjust to the time change. I kind of felt like everyone was in a bit of a daze after sleeping on a plane/ going right to touring Rome, but it worked. We joked with Maggie because with all the beautiful things to see in Rome, she kept talking about how adorable their pigeons are. She wanted to follow them, try and pet them, etc. The following day, while in St. Peter’s Square, about to walk into the Vatican…. a pigeon pooped on Maggie’s head. 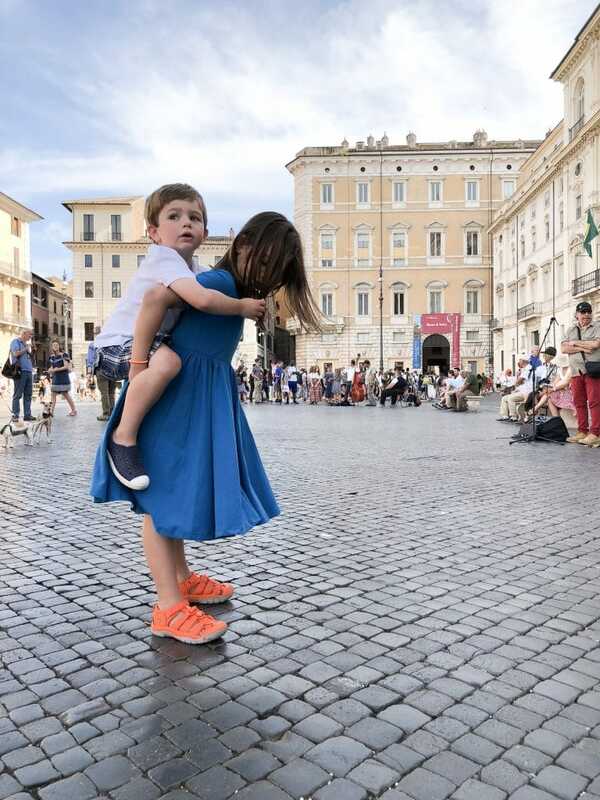 While anyone else would have freaked out (my other kids would have cried), she said it was no big deal and she still loved the dirty pigeons and said it was good luck and EVEN LUCKIER to get pooped on by a pigeon at the Vatican. 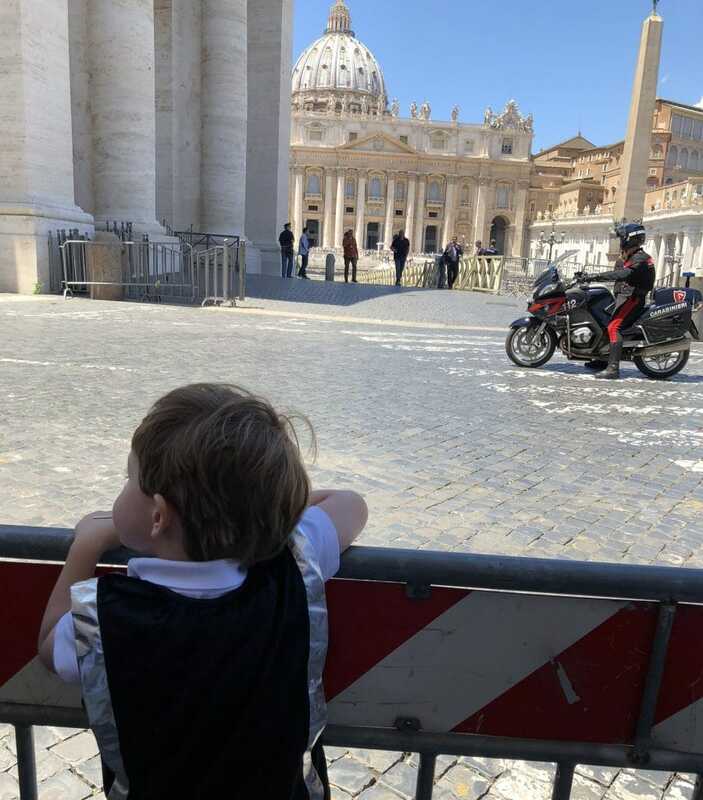 Right after Maggie and her pigeon poop hair went off on a Vatican tour with Grammy and Alex, the boys and I noticed lots of Carabinieri motorcycles lining up. Of course the boys wanted to see them up close so we went as close to the barricades as we could. Then I realized they looked like they were up to some serious business and a crowd was gathering around us. The couple next to us explained that Preident Macron of France was at the Vatican for a meeting with the Pope and was about to leave. So we stayed and watched. If you ask Tommy one of his favorite parts of the trip, he’ll probably say “the president with the police”. Years ago I was in the Uffizi Gallery in Florence with my brother & cousin and we got separated and couldn’t cross back to find each other in the museum and as we were trying… Vladmir Putin walked by. I don’t often run into famous people, but apparently when I do, they’re European rulers. 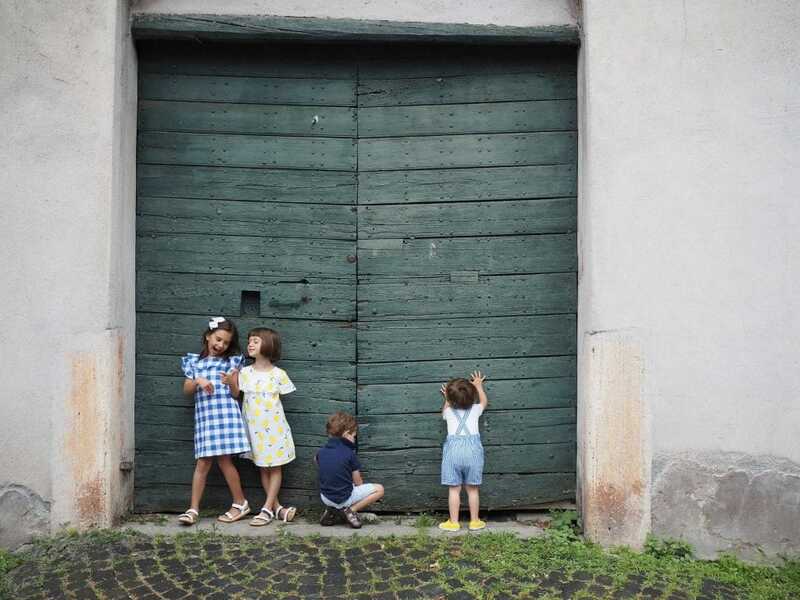 I’ve loved watching the kids explore Italy this week especially because it’s the first time they’ve ever been around people speaking another language (just wait until we head to the small beach town next). The girls are trying to use what they learned in Italian class and Tommy is trying harder than I expected to learn words. 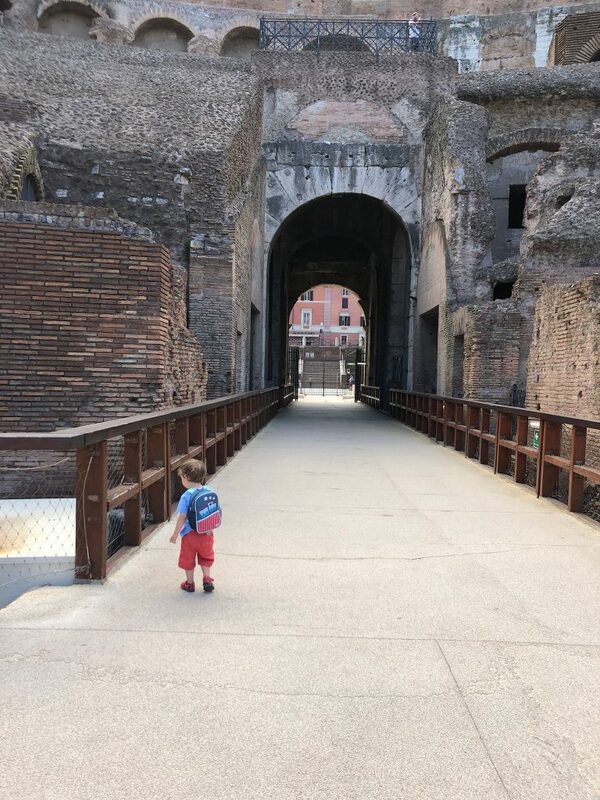 His favorite is to yell “andiamo” and then run as fast as he can. His sweet version of “per favore” made all the waitresses go crazy at lunch one day. 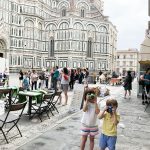 The “new Italian life” event this week that still has us laughing: one of the little darlings came out of the bathroom announcing that they tried to use “that cute little extra sink” and it sprayed all over the place…. it was the bidet. Then of course there were a lot of questions about a bidet…. and a lot more times that kids turned it on and soaked the entire bathroom. We’ve laughed a lot, ate a whole lot, slept some and endured a lot of meltdowns. We’ve all thoroughly enjoyed watching how much Miles appreciates the food here. He eats more at meals than a grown man and shovels it in so fast he barely comes up for air. God bless Grammy for all her help. 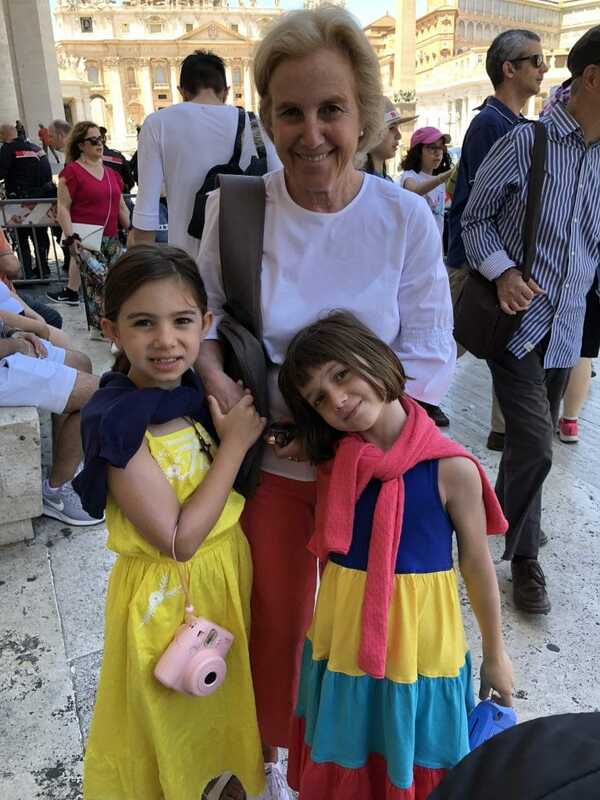 For anyone who really wants to know the key to taking 4 little kids to Rome, invite Grammy is my #1 tip. After many (many!) nights of searching, I decided on this apartment and we really lucked out. I went with a spot near the Vatican because we had 2 days of activities there. Also, it felt really safe being so close to the Vatican. If you have been to Rome: if you’re looking at St. Peter’s and all of the columns you’d go through the back left area of columns and there’s a nice little neighborhood. We were about a 5 min walk to St. Peter’s. The neighborhood had a very “neighborhood” feel and it did not feel touristy at all. 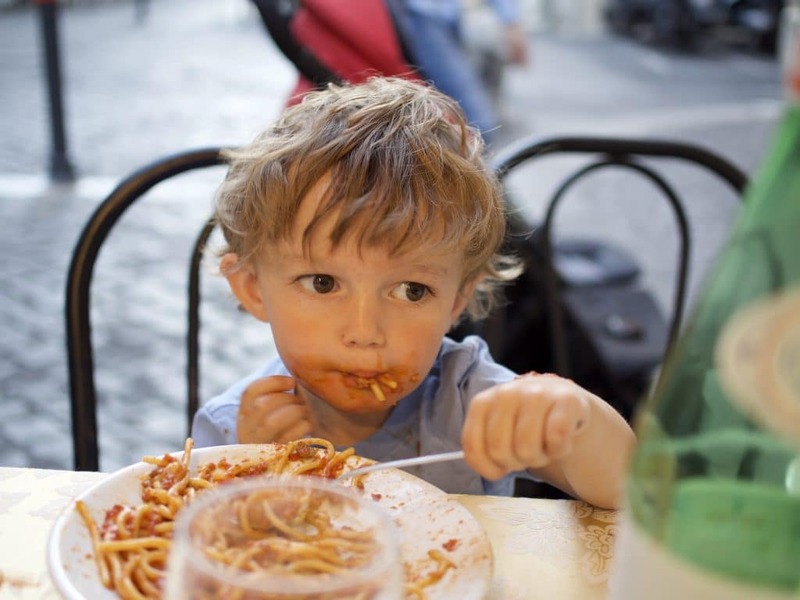 People in the shops were so kind to the kids and let them try their Italian. 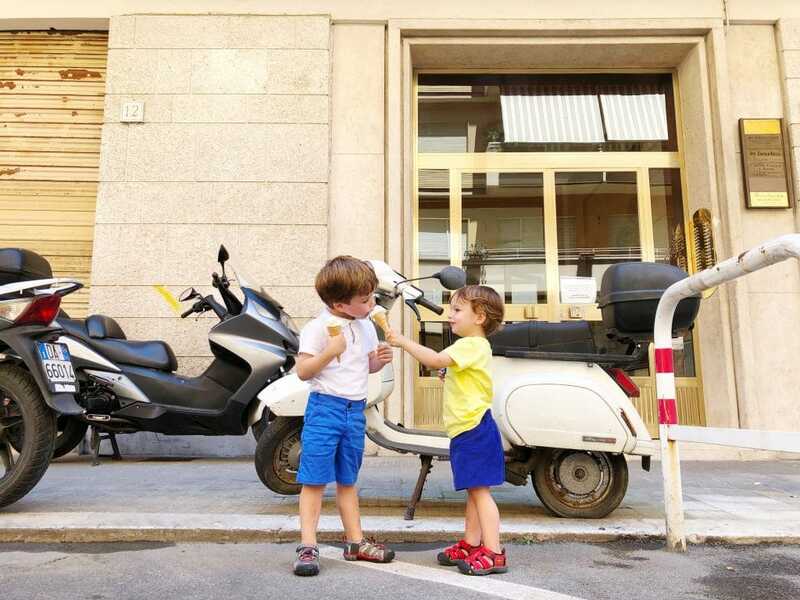 We made fast friends with the old man at the gelato shop on our corner, who even gave the kids a free cone or two throughout the stay. Because it was a neighborhood, instead of shop after shop of cheap Rome souvenirs, there were really useful shops like: a grocery store, a store that was small but literally sold everything imaginable (my kids called it the mini Italian Target), really good inexpensive restaurants, a coffee shop and a laundromat where a kind Italian lady took the laundry when you walked in the door and told you to come back in 2 hours for dry, clean laundry…. All for 8 euro. We fit 6 of us comfortably and never even used the pullout couch. It’s really great for a family and has a kitchen, a nice balcony and a washer (no dryer, that’s why I visited the laundromat once). I had read about this spot before we went as being one of the best “hidden gem” pizza spots in Rome. I was pleasantly surprised to find out it was 2 blocks from our apartment. It was amazing and cheap. If you are near the Vatican this is a great lunch spot. We ate lunch here and it was a great spot near Piazza Navona. Just off the main square (to save $!) there are a bunch of cute little spots. This one has air conditioning and such a nice staff. They brought out coloring pages and colored pencils for this kids and it was an overall great experience. Another great spot near the Vatican (it was 1 block from our apartment) . Delicious food and really nice staff. You can eat inside or out. Borgo Pio is close to the Vatican. We walked down here after visiting Castel Sant’Angelo. It was a really beautiful street with lots of places to eat outside. 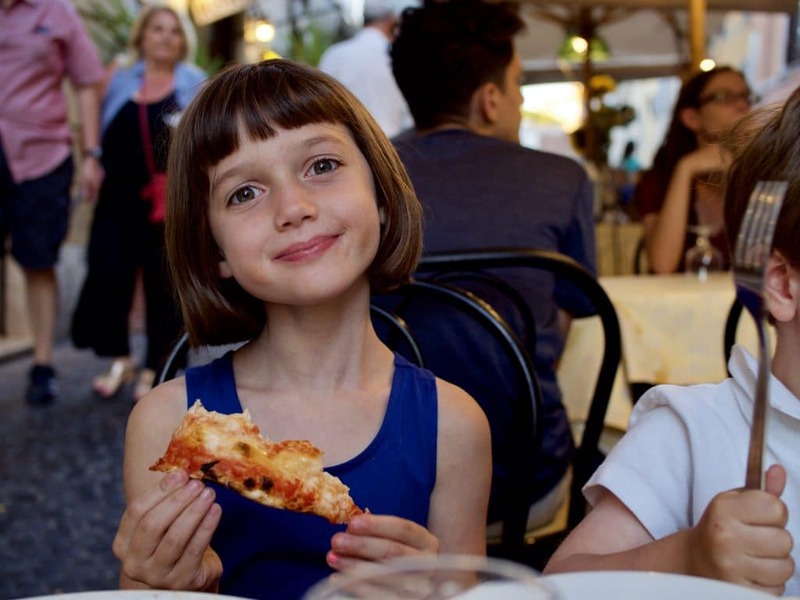 We had a great meal at Tre Pupazzi and it helped that there were people playing music and the kids could dance around the table while we ate. We were outside and there are no cars on the street aka perfect for little kids. 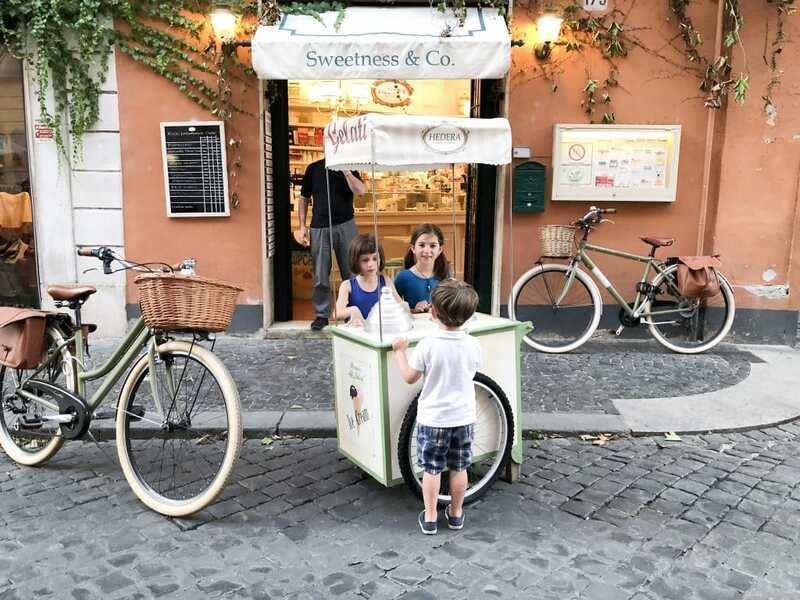 This was our favorite gelato spot in Rome. It’s also on Borgo Pio (same block as the restaurant above). It was really cute (photo below), had a fun little booth to sit in inside and the people that worked there were so kind. My kids favorite Piazza. Plenty of space to run during the day and at night plenty of entertainment. Three fountains in one piazza made it even better for them. 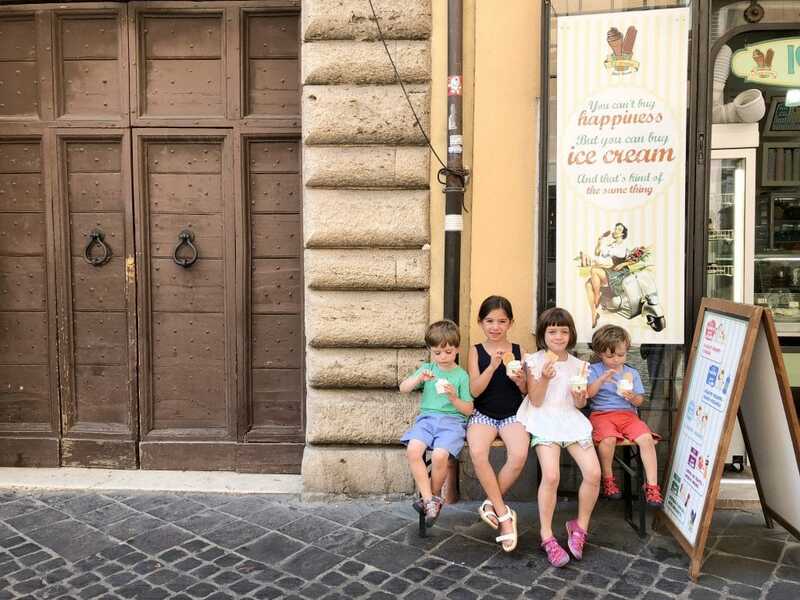 This is in Piazza Navona but a spot not to miss with kids. I read about it on a blog before we went and made sure to find it. It’s an amazing toy store. It’s not that big, but has 2 floors and spiral staircases to reach it. It was fun for the kids and probably the prettiest toy store I have ever seen. 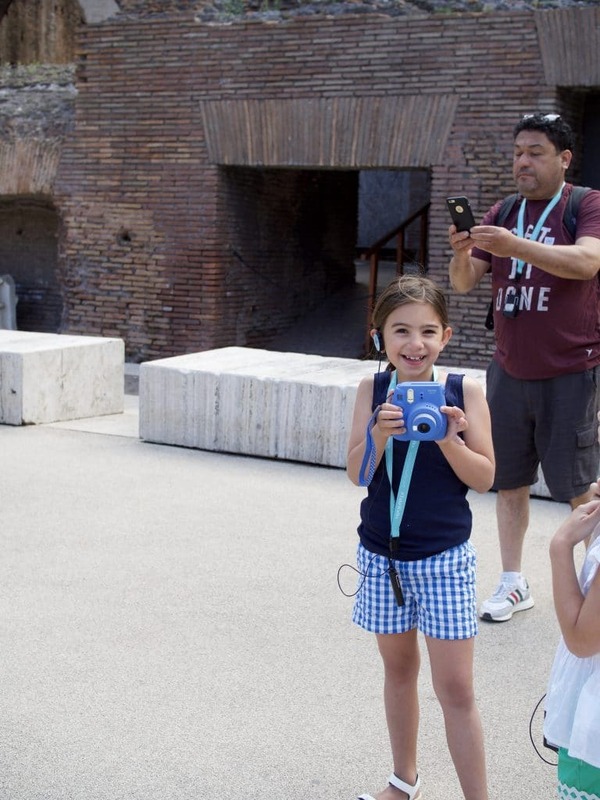 This was the site my kids were all most looking forward to in Rome. I have been several times so I figured we’d just go and I’d show them around. Then I started reading that even with the “skip the line” tickets, you can wait up to 2-3 hours in the busy summer months. Since standing in the hot sun for 3 hours with my kids didn’t sounds like a great time and we couldn’t skip the one thing they all wanted to see, I booked a tour. 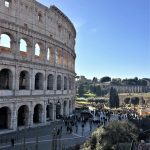 I did the Walks of Italy Gladiator Entrance Tour that gets you into the Colosseum before it opens to the public and through a different “secret” entrance. It was honestly worth every penny. We didn’t wait 1 min to get in and it was totally empty when we got in. They had room to explore, it was still cool out and really enjoyable. 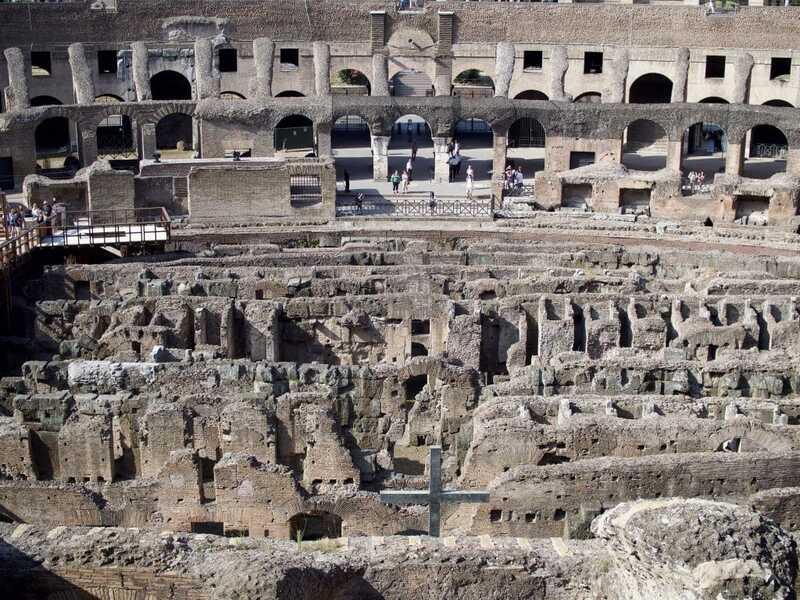 The tour included a lot more of ancient Rome like the Forum and Palatine Hill. 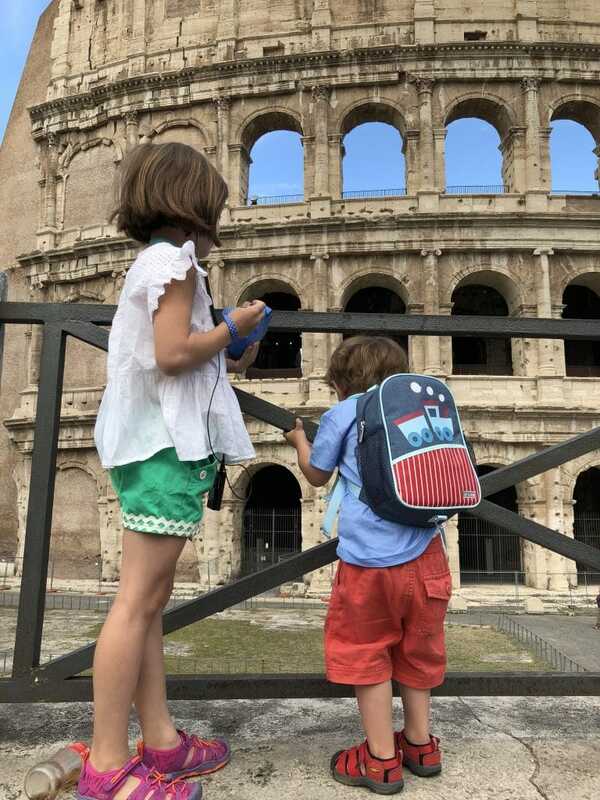 There was no way we were doing a walking tour for 3+ hours with the kids, so we bailed mid Colosseum, ran around there on our own and that was all we saw of ancient Rome. 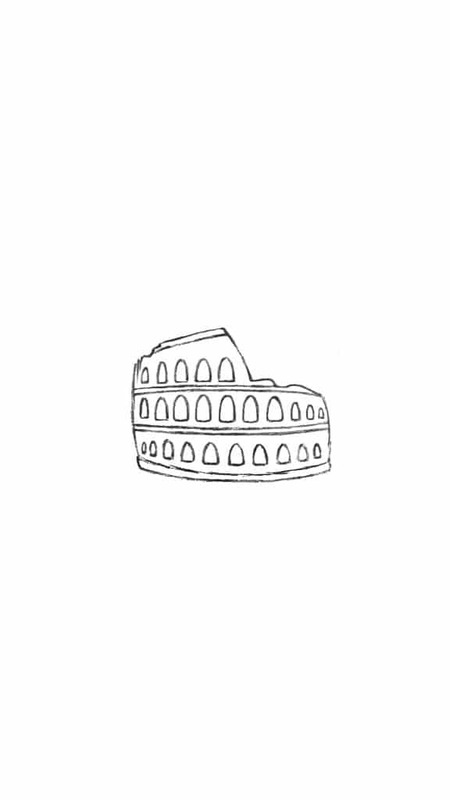 Personally I think the Colosseum is the only kid friendly part of ancient Rome, in the summer, for really little kids because it’s so spread out and there’s no shade. We luckily took the “long way” around all of it in our cab after, so the kids saw more of it from the road. 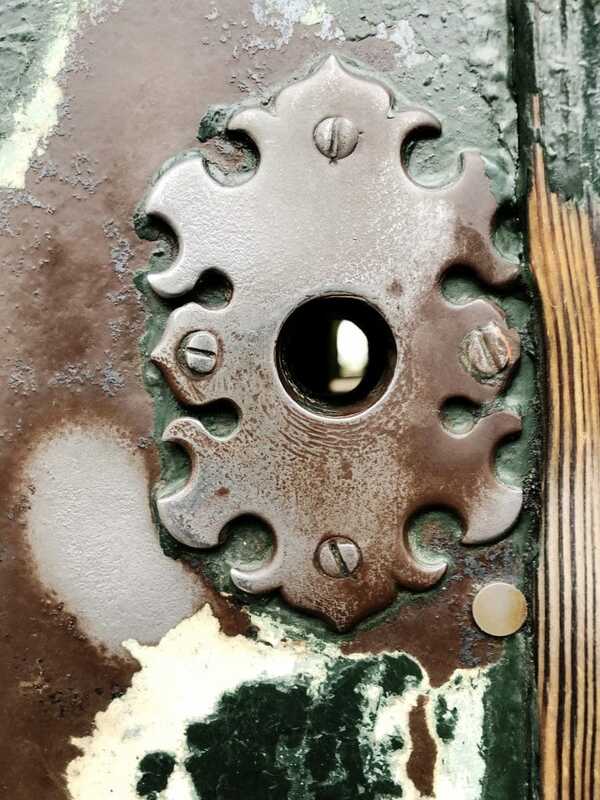 I have wanted to see the key hole at Aventine Hill for a long time. I didn’t get the photo I had hoped for BUT honestly think this is one of those sites that is a lot more beautiful to see and experience than see a photo of. So if you have a chance to visit Rome, take a trip up to Aventine Hill. The girls recently saw The Secret Garden, so they thought peering through the keyhole into a private garden was SO cool. After that, it was raining, so we didn’t explore any more of this area. We went right after dinner one night. It was insanely crowded and I have no idea how we made it down to the bottom of the stairs. BUT kids love fountains and this is obviously not the one to skip. They all thought it was awesome. What was not awesome was that I realized AFTER pushing through the crowds that I had no coins. Grammy found 2 in her purse, the little guy had no idea what he was missing and I convinced one that it was just as lucky to throw in a lifesaver (sorry fountain). 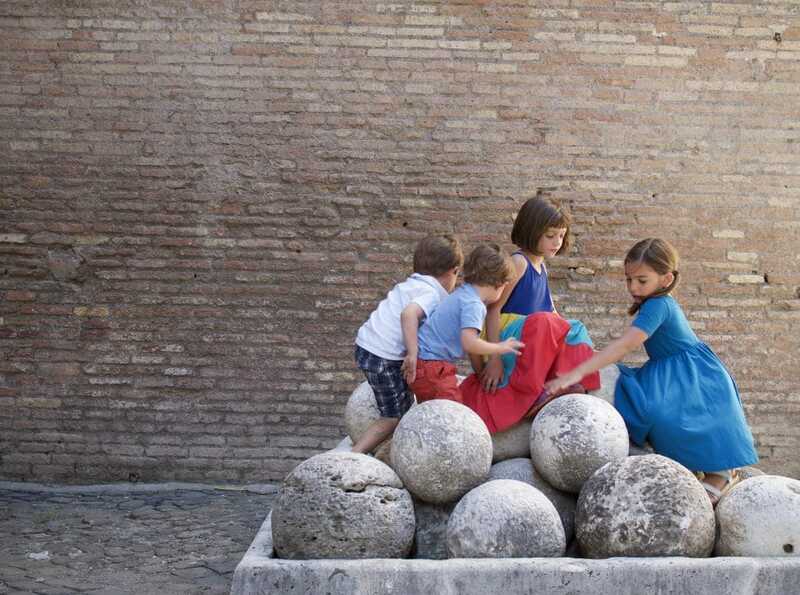 this was one of my favorite sites to see with kids in Rome. 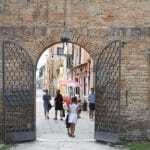 It’s free for kids to enter (14 euro for adults) and is really manageable with little ones. They all loved it and thought the cannon balls were “so cool”. We all walked up to one level and then Alex, Tommy and I ventured up to the top. The views of the city and especially the Vatican from the top of the Castel Sant’Angeloare are incredible. Then you leave the castle, if you are looking at the river, turn left and there’s a really cute carousel! Overall: Rome is a big city with a lot to see and do. I had quite a lot of things I planned for us to do that we didn’t get to. 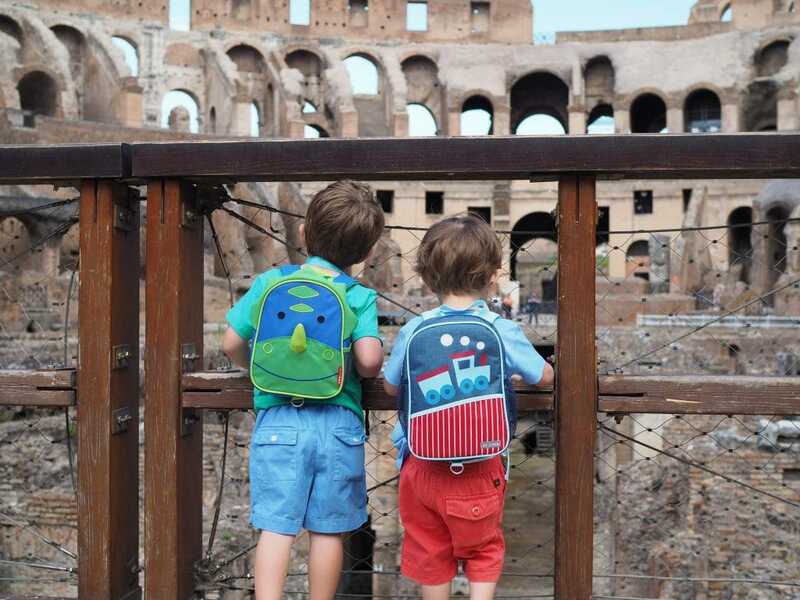 We had planned to see The Spanish Steps, more of ancient Rome and the Borghese Gardens, Gallery and Zoo there. 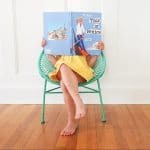 With little kids, in the summer heat, there is only so much you can do! It’s not the most stroller friendly city, but didn’t have a problem pushing lightweight umbrella strollers around when we needed them. We also took cabs and Uber when needed. 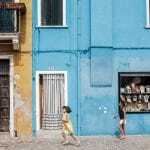 We were so happy to be in Italy eating gelato and pizza that we saw as much as we could and spent time resting and just enjoying good food and our cute neighborhood too. What a great post! 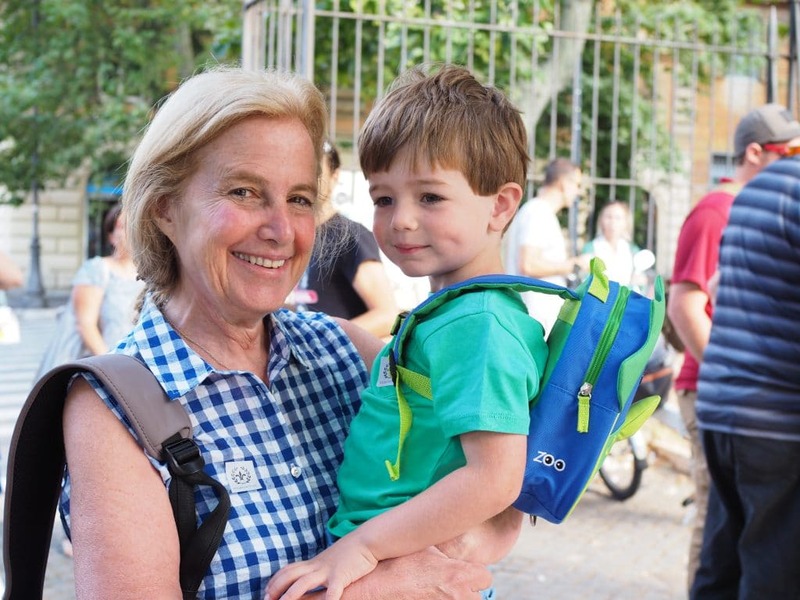 I love all your Italian adventures and bringing a grandma along is my secret weapon too! Tell Maggie that when I was in London with my sister as kids, a pigeon pooped on her and we still talk about it now. It is definitely good luck, especially when you travel.